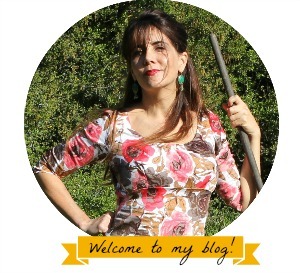 Welcome to the design it yourself clothes draft along! Today I will show the process I went through to draft the button down shirt front and back. 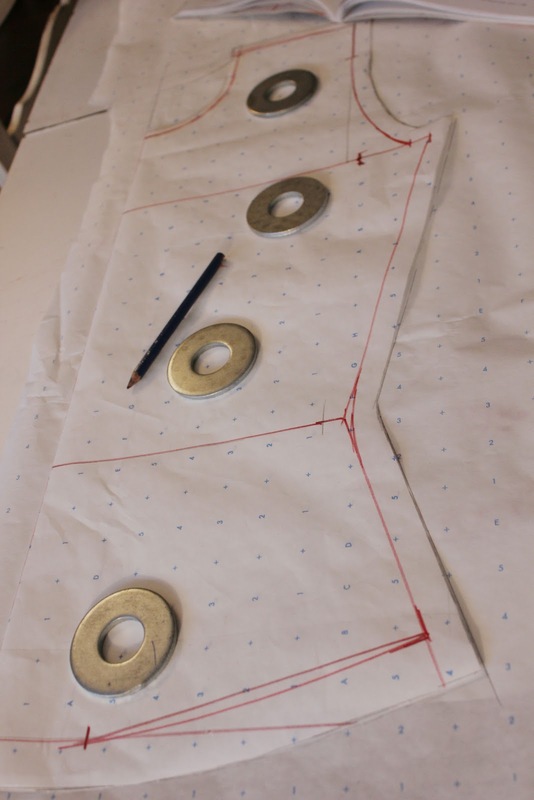 next week I will be drafting the collar, cuffs, sleeves and making a muslin. If you would like to visit some of the posts from this draft along I will list them below. 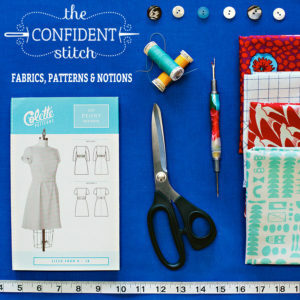 Today is the last day of the Celina Mancurti fabric giveaway. Stop by and enter if you haven’t yet. 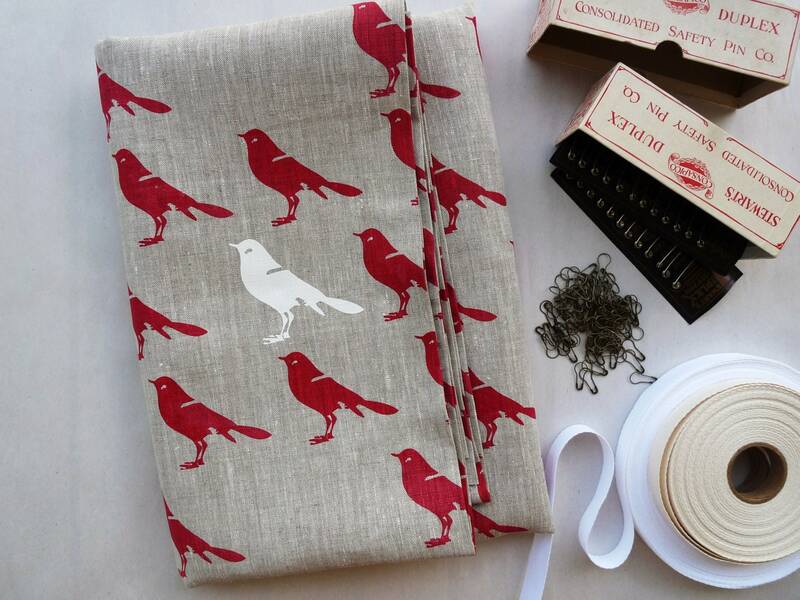 I love this fabric. I followed all of the steps from the book to make the button down shirt pattern and took photos illustrating all of the steps. I’m looking forward to having a proper button down shirt! 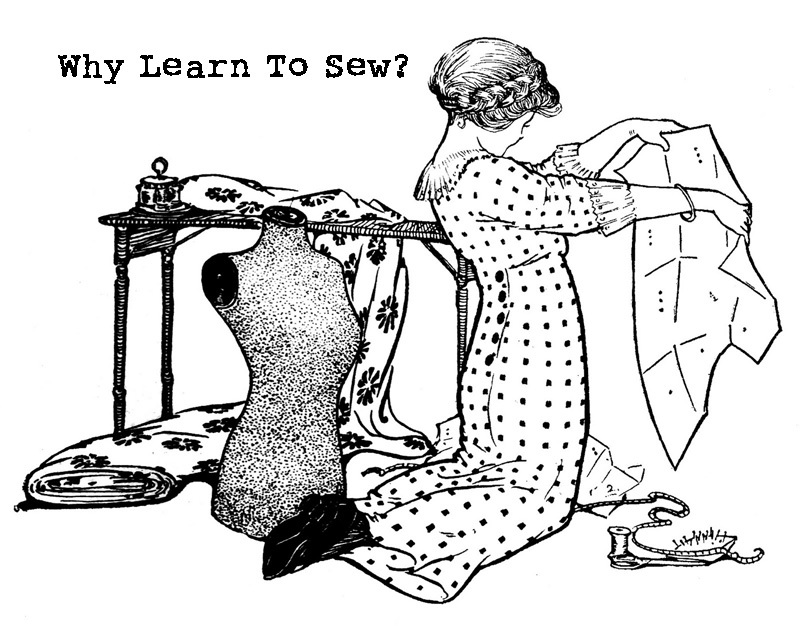 To tell you the truth, I have never sewed one.. ….Tomorrow I am going to an estate sale with fabric! 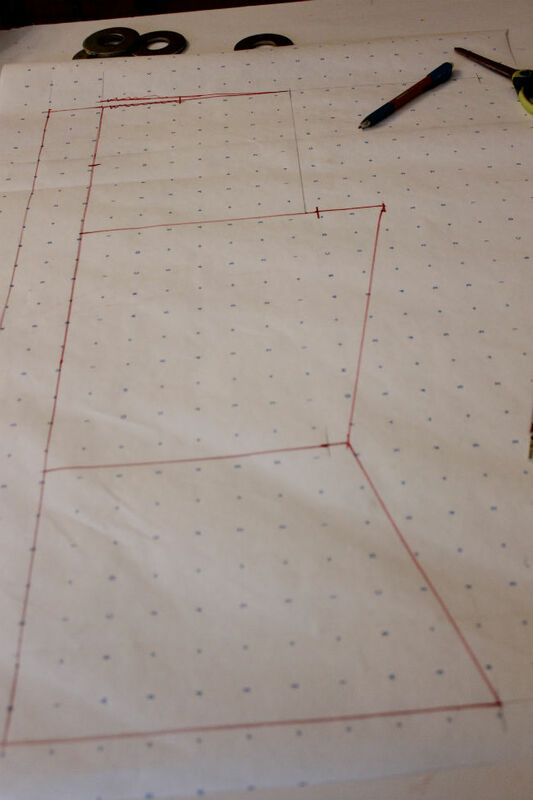 Maybe I will find just the right fabric for it….. perhaps a Liberty of London print. 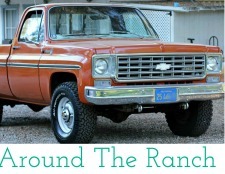 I can always dream…. 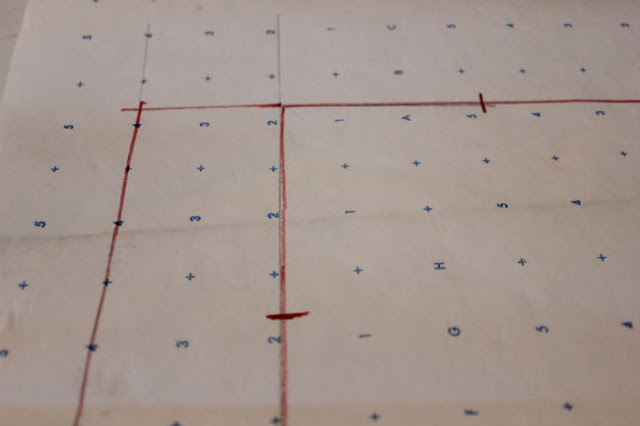 The Button Down Shirt Pattern shown in the book Design It Yourself Clothes. Click here to read a short tutorial from Cal Patch about drafting the button down shirt. 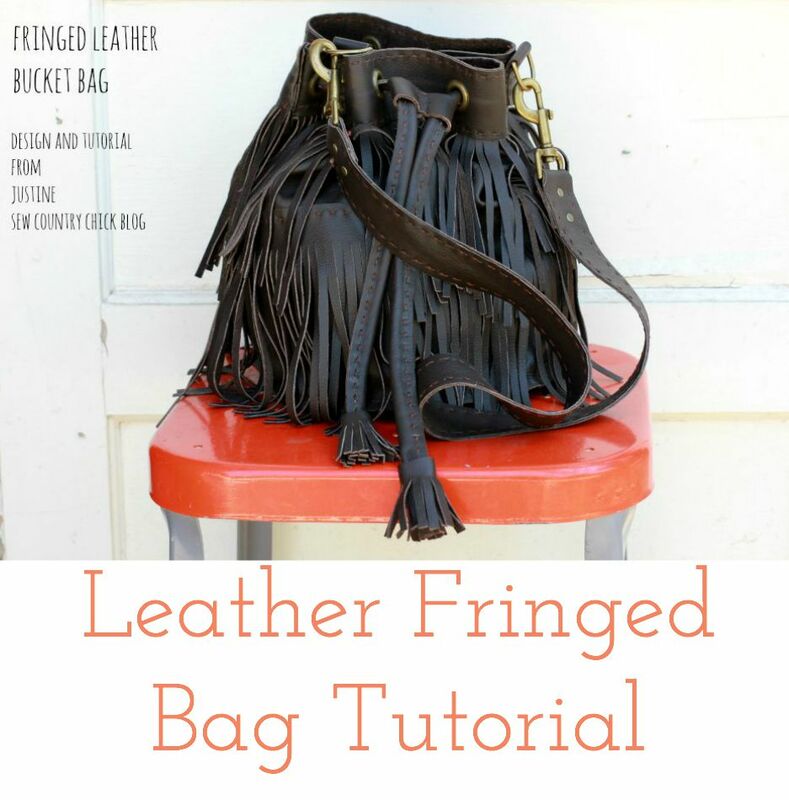 Before I show you my drafting process I would like to discuss functional ease. 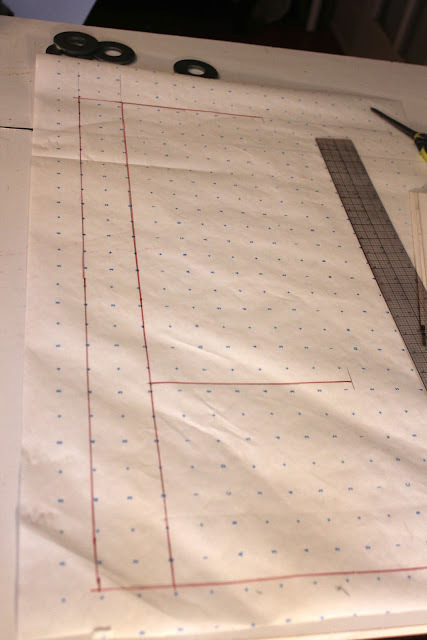 You will need to add some ease to your shirt pattern since unlike the t shirt this is a pattern for wovens and you won’y be able to move if you don’t add some. However, I like wearing my clothing very fitted so I am adding the minimum amount of ease recommended for a button down shirt and that is 2 inches throughout the bust, waist and hips. 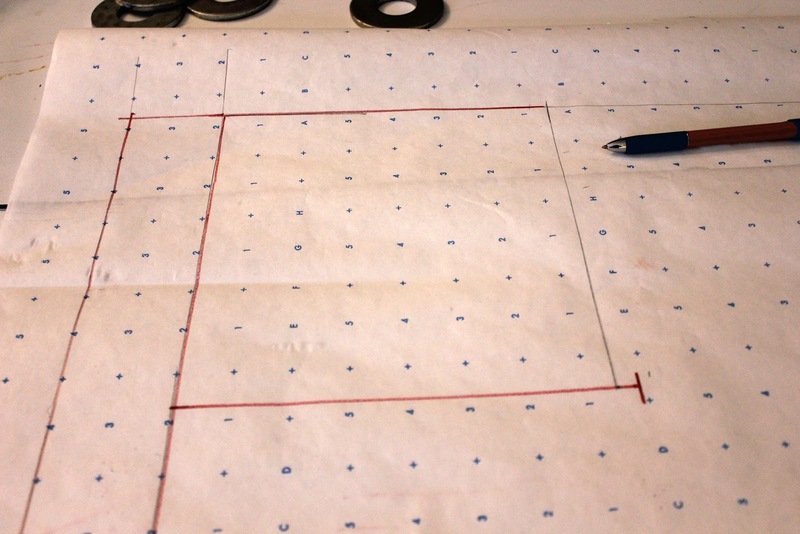 Since I am drafting the pattern on the quarter pattern I am adding 1/2 inch to each quarter pattern piece. Before you get started make sure you take all of the measurements you will need for your shirt pattern. 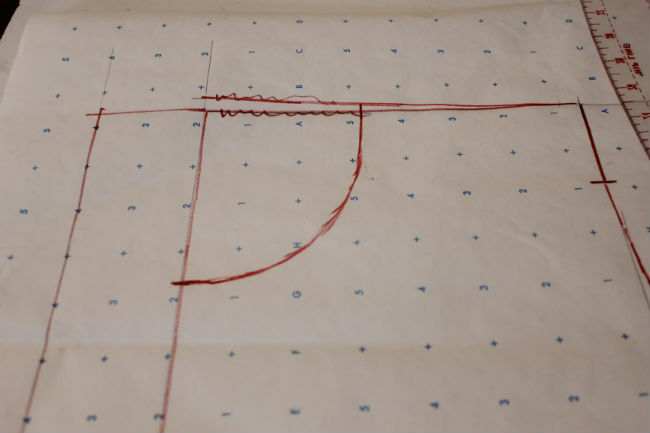 Draw your center front line lengthwise and your placket line 2 inches to the left of it on your paper. Draw half your shoulder measurement, then measure down the paper to your length measurement. Measure down from the shoulder your HSP waist measurement you took. Craw your quarter waist and quarter hip measurements. 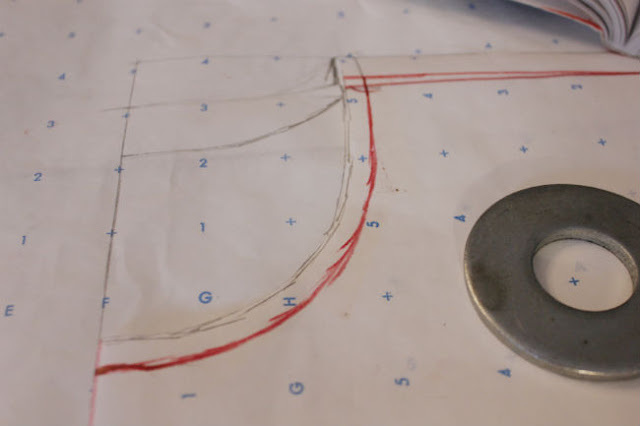 To find where your bust line should be use the armhole depth measurement you used for the t shirt and add an inch or two to it. My measurement for my t shirt was 7 inches so I added only an inch. I want my shirt more fitted. 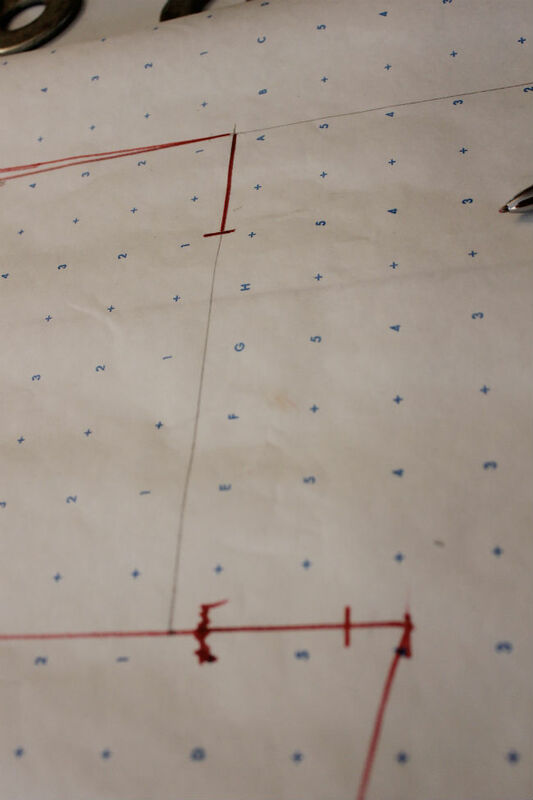 Connect the lines. I measured down here from the shoulder than drew my bust line shoulder across at that height. 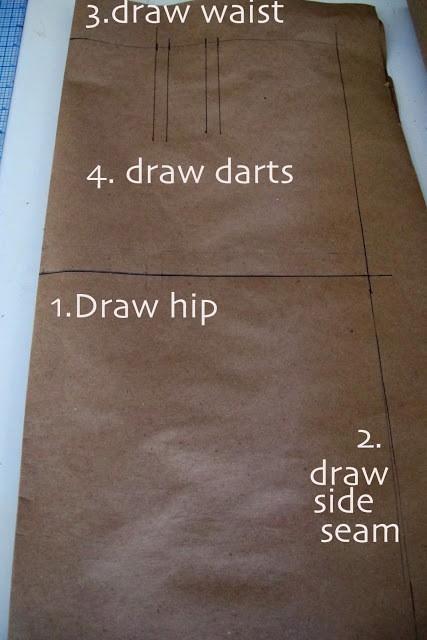 Measure down two inches from the shoulder edge and draw a straight line. 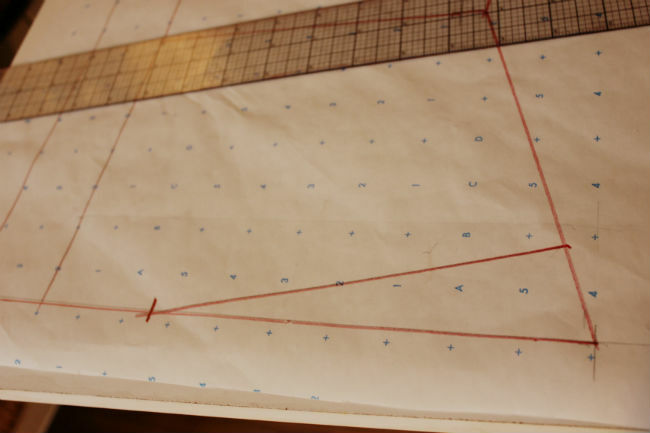 Measure in 1/2 inch from side seam bustline and draw a straight line. 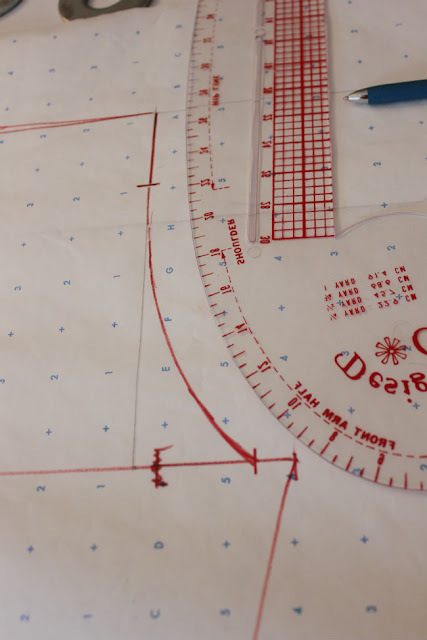 Draw your armhole curve from those lines with the curve ruler. Mark half your neck measurement on the shoulder line. Mark your front neck drop on the center front line. Draw the neckline freehand. 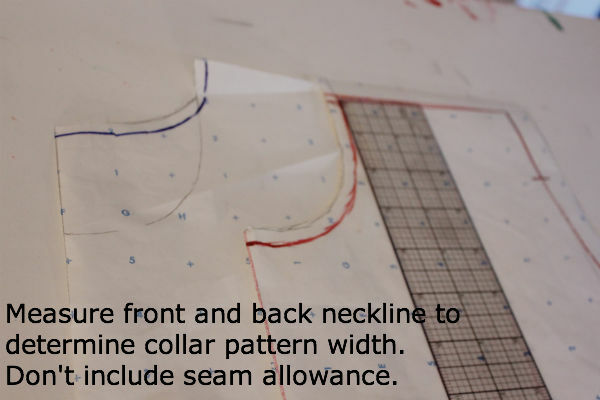 Raise the shoulder 1/4 inch at the neckline to make the shoulder slope a little. Smooth out all of your seamlines. 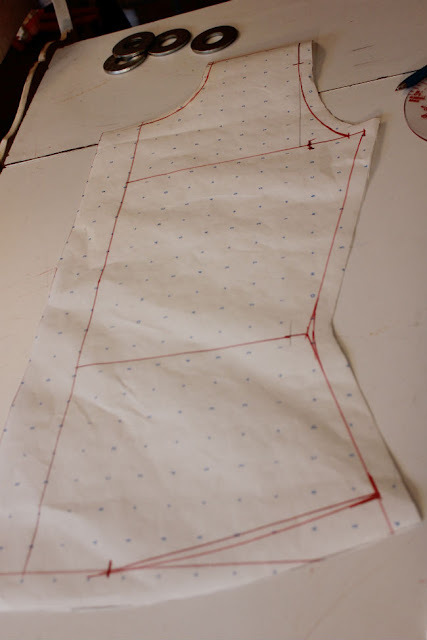 I added 5/8 inch seams and a 1 inch hem and 1/4 inch at the neckline. Lay your front pattern down on more paper and trace it, omitting the front placket extension. That’s it for today! 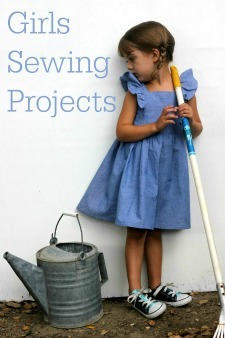 If you have any projects from this draft along you would like to share post them down below on my linky! 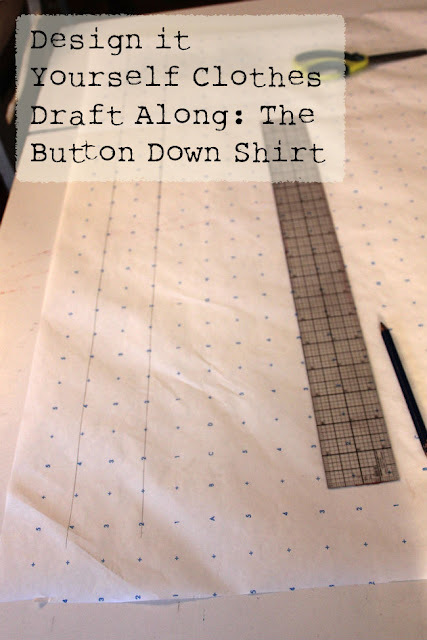 This is the one I have been waiting for – I find button-downs so difficult to fit that I want to make my own pattern and use it over and over again. Have I mentioned what a fun series I think this is? You are quite the talent! While close , your missing some key steps for a well drafted professional patter. Good try though! 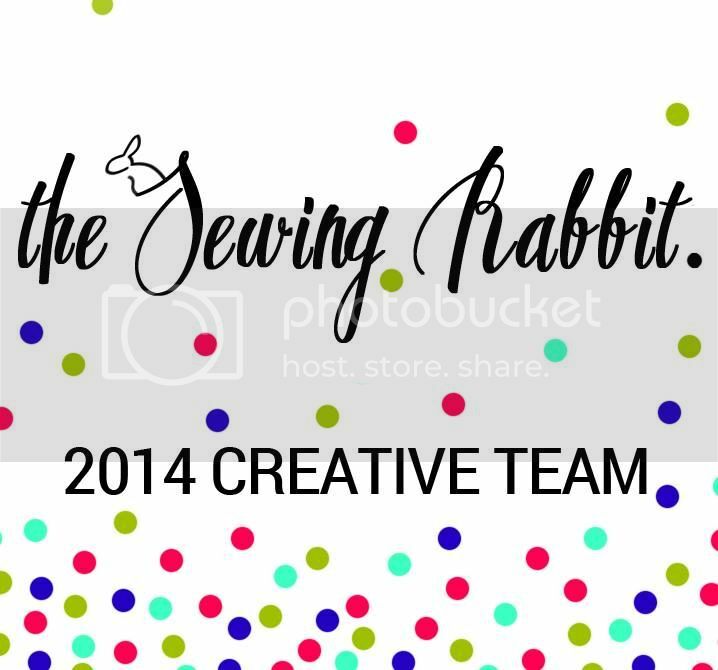 Although this is not my blog, I do feel obligated to say something to your comments, I for one appreciate everything Justine is doing in this sew-a-long, it’s a learning experience for some of us. I understand constructive criticism, but criticizing someone without offering suggestions, is just plain criticism better left for another sort of blog. I agree, if you’re going to comment something like that on another person’s blog, you should offer suggestions, if you are truly a “professional drafter”. Otherwise you’re just a troll. Thanks so much for the time you spent doing this. I already have ‘project list impossible’ but its jumped the queue!! I am looking forward to this one, I really want to start making button down tops that are different than what you can find in stores. I really appreciate the time you spend doing this, it’s a learning experience for me. Wow miss “Anonymous” maybe if you really read the post you would understand that Justine was just fallowing the book and had nothing to do with her skills! And haven’t you ever herd the saying, If you don’t have anything nice to say don’t say anything at all. This is great! 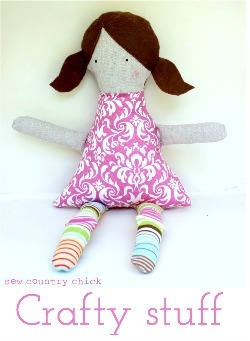 I really need to take some time to sew for myself! 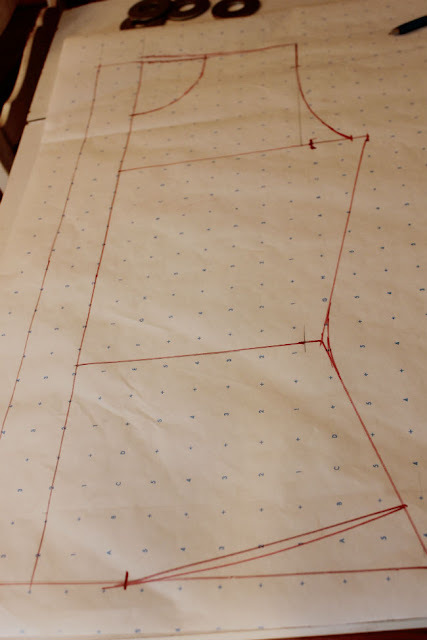 I just finished my pattern. Next I’ll try the muslin. Thanks for doing the draft-along. I never would have gotten through the book without you, and I’m so proud to say I made my clothing AND my pattern!